After spending her childhood in France, Mary returned to Scotland in 1561. Her personal rule lasted until 1567 when an alliance of Protestant nobles forced her to abdicate in favour of her infant son, James VI. 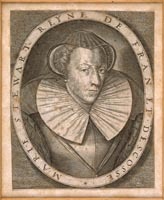 She later fled to England, was imprisoned by the government of Queen Elizabeth I, and finally executed in 1587. This contemporary image of Mary was engraved by Thomas de Leu (fl. 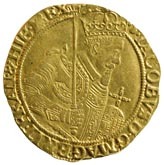 1560-1620) of Flanders. 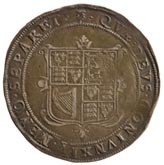 The motto on the reverse from the Book of Ezekiel 'Faciam Eos in Gentem Unam' refers to James's claim regarding the Scots and English to have 'made them one people' and that his right to rule came from God, while the name of the coin, 'Unite', also refers to the Union. Scottish coins minted after 1603 had a value of 1/12 of English ones and were interchangeable throughout Britain. The motto 'Nemo Separate Quae Deus Coniunxit' is the famous phrase from the Gospel of Matthew 'Let no-one separate what God has put together' that is used in marriage ceremonies. It would have had a particular resonance after the English parliament rejected his proposal for a union with the Scottish parliament in 1604. Although the Union of 1707 was a unique historical event, the idea of uniting Scotland and England had been proposed on various occasions since the early sixteenth century. In pursuing her claim to the English throne in the 1560s, Mary Stuart, Queen of Scots, promised a peaceful union between England and Scotland. This possibility became a reality in 1603 when on the death of Elizabeth I, King James VI of Scotland, her closest protestant relative, succeeded to the thrones of England and Ireland, thus creating a personal union between the three kingdoms. James proclaimed that his reign heralded a new and divinely ordained 'Kingdom of Great Britain'. However James's efforts to unite the English and Scottish parliaments failed as a result of English objections. The execution of James's son, King Charles I, during the civil wars of the 1640s was followed by the creation of an English republic, which conquered and occupied Scotland during the 1650s. After 1660, the restored Stuarts placed less emphasis on the idea of a unified Great Britain, and stressed instead the personal bonds of monarchy. During the reign of King James VII and II (1685-1688) this ideology combined with a powerful sense of Catholic hierarchy and legitimacy to reinforce the vision of the Stuarts as the guarantors of religious order and political unity.